Why Are Obstetricians Top Billers For Group Therapy In Illinois? : Shots - Health News Illinois leads the U.S. in group psychotherapy sessions for Medicare patients. Some top billers aren't mental health specialists. The state's Medicaid program has cracked down, but the feds haven't. Unusual billing for group therapy led to a crackdown on Medicaid payments in Illinois. 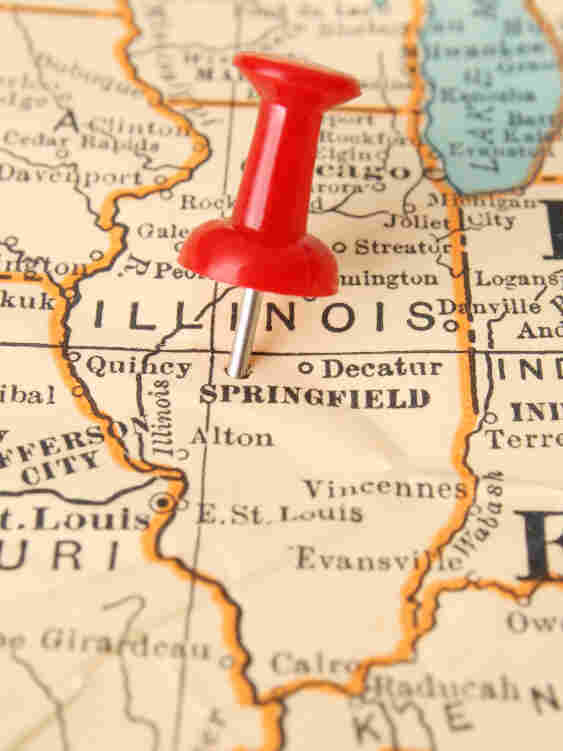 A few years ago, Illinois' Medicaid program for the poor noticed some odd trends in its billings for group psychotherapy sessions. Nursing home residents were being taken several times a week to off-site locations, and Medicaid was picking up the tab for both the services and the transportation. And then there was this: The sessions were often being performed by obstetrician-gynecologists, oncologists and urologists — "people who didn't have any training really in psychiatry," Illinois Medicaid director Theresa Eagleson recalled. So Medicaid began cracking down, and spending plummeted after new rules were implemented. In July 2012, the program stopped paying for group psychotherapy altogether for residents of nursing homes. Yet Illinois doctors are still billing the federal Medicare program for large numbers of the same services, a ProPublica analysis of federal data shows. Medicare paid Illinois providers for more than 290,000 group psychotherapy sessions in 2012 — more than twice as many sessions as were reimbursed to providers in New York, the state with the second-highest total. Among the highest billers for group psychotherapy in Illinois were three OB-GYNs and a thoracic surgeon. The four combined for 37,864 sessions that year, more than the total for all providers in the state of California. They were reimbursed more than $730,000 by Medicare in 2012 just for psychotherapy sessions, according to an analysis of a separate Medicare data set released in April. "That's not good," Eagleson said when told of the Medicare numbers. Medicare's recent data release has led to a string of analyses showing how waste and fraud is inflating the nation's bill for health care. This work has echoed the findings of ProPublica's investigation last year into Medicare's prescription drug program known as Part D, which had fewer barriers to waste and fraud than other government health care programs – and was making less effective use of its own data. Of the Illinois OB-GYNs billing for group psychotherapy, Dr. Josephine Kamper had the highest number of sessions. She was paid for 10,400 sessions in 2012, at a cost to Medicare of $207,980. In 2011, the state Department of Financial and Professional Regulation placed Kamper on two years' probation for failing to evaluate a patient undergoing an abortion prior to anesthesia and failing to collaborate with a certified registered nurse anesthetist. The terms of her probation didn't prohibit providing psychotherapy. Efforts to reach Kamper for comment were unsuccessful. A OB-GYN named Lofton Kennedy Jr. billed for 9,154 group psychotherapy services. He declined to comment. The third-highest-billing OB-GYN, Philip Okwuje, charged Medicare for 8,584 group therapy sessions. In a brief interview, he said he doesn't do them anymore. Okwuje was barred from Medicare and Medicaid from 2002 to 2005, records show, though the reason wasn't immediately available. Thoracic surgeon Mark Lubienski said he began working with a company that offered group psychotherapy because he had to go on disability and could no longer perform surgeries. He had been experiencing episodes in which he temporarily lost consciousness. Medicare paid $194,540 for more than 9,700 of his sessions in 2012, though Lubienski shared a tax form showing he received only about $52,000 from the company, Unified Therapeutics. "I basically supervise social workers who run therapy sessions in intermediate and long-term care facilities for people who have psychiatric diagnoses," Lubienski said. "I'm there, I pitch in, I discuss things with the residents and stuff. We have a calendar of Medicare-approved topics that we go by." And for residents who can't participate in the group sessions, "we see them individually." Lubienski also was paid for 96 psychiatric interviews to diagnose mental illness. Lubienski said he doesn't see a problem with doctors who are not psychiatrists performing these services. "In certain states, it's mandated that the facilities have to offer these services yet there's nowhere near enough psychiatrists, psychologists, doctors, social workers to do it," he said. Unified Therapeutics chief executive Todd Occomy said his company stopped providing the service in 2012 after the Medicaid changes in Illinois and has essentially ceased operations. "We were just getting squeezed," he said. "It got to the point where we could barely pay our physicians." Aaron Albright, a spokesman for the U.S. Centers for Medicare and Medicaid Services, said in an email that Medicare has no policy regarding which physicians may perform group psychotherapy. During such sessions, "personal and group dynamics are discussed and explored in a therapeutic setting allowing emotional catharsis, instruction, insight, and support," according to rules set out by one of Medicare's contractors. Group psychotherapy doesn't cover such activities as socialization, music therapy, art classes, excursions, sensory stimulation or eating together. Typically groups can be no larger than 12 people. Albright said he couldn't comment on individual providers but added that "deterring improper payments is a top priority for CMS in order to protect beneficiaries and taxpayers." The billings for group psychotherapy reveal other unusual patterns. A Queens, N.Y., primary care doctor, Mark Burke, was paid for more sessions than anyone else in the country — 20,841. He accounted for nearly 1 in every 6 sessions delivered in the entire state of New York in Medicare, separate data show. He didn't return messages left at his office. Another large biller was Makeba Gordon, a social worker in Detroit. She was reimbursed for nearly 5,000 group therapy sessions for her 26 Medicare patients, an average of 190 each. She also billed for 2,820 individual psychotherapy visits for the same 26 patients, who allegedly would have received an average of 298 therapy sessions apiece in 2012. Gordon couldn't be reached for comment. A Chicago internist named Amjad Zureikat, who billed for 6,983 sessions, said he served two nursing homes and used books to help guide his discussions with patients. "We take the subjects from those books and we discuss it," he said. Zureikat said he no longer practices as an internist but works three or four hours a week providing the therapy sessions and also is president of a local managed care organization. "It is not that I enjoy it, it is something to do and it is useful to the residents and their families and the nursing home," Zureikat said. To limit group psychotherapy billings, Illinois Medicaid first implemented rules that limited patients to no more than two sessions in a seven-day period, with a maximum of one a day. It then began requiring that physicians who bill for group psychotherapy complete a psychiatry residency program or be part of one. The rules brought immediate results. In the year before September 2009, when the first changes were instituted, the program paid $30.4 million for these services, including almost $3.7 million to a single urologist. In the year afterward, the spending dropped by more than two-thirds. Payments for nursing home residents were cut off entirely in 2012. Asked why Medicare hadn't taken similar steps, Eagleson, the Illinois Medicaid director, said she couldn't explain it. "I'm sure we can always all learn from one another," she said. "Trying to get this more coordinated is certainly one of our goals." For more, read ProPublica's Examining Medicare series, which looks at providers with unusual billing patterns, and search for your own health provider in Treatment Tracker.